As someone whose lifetime experience of Mexican cuisine was previously limited to Old El Paso meal kits and cactus-themed restaurants, I can safely say that actual Mexican food from actual Mexico is worth spending time discovering. Mexico is DELICIOUS. So delicious, in fact, that its food has been added to UNESCO’s Intangible Cultural Heritage list (and, now, Jen’s Tasty Good Times list). Am I the only Brit who didn’t realise chili, fajitas and burritos aren’t traditional Mexican foods? These dishes actually originated in the US when Mexican immigrants tried to create the flavours of home using American ingredients and cooking styles. While you can definitely order fajitas and burritos in Mexico these days, it’s not really traditional food. It’s a bit like going to India and ordering a Tikka Masala. While we use wheat dough to make everything from pizzas to toasted muffins, Mexicans use masa, a corn paste, to create variations of tortilla which are served with pretty much everything. 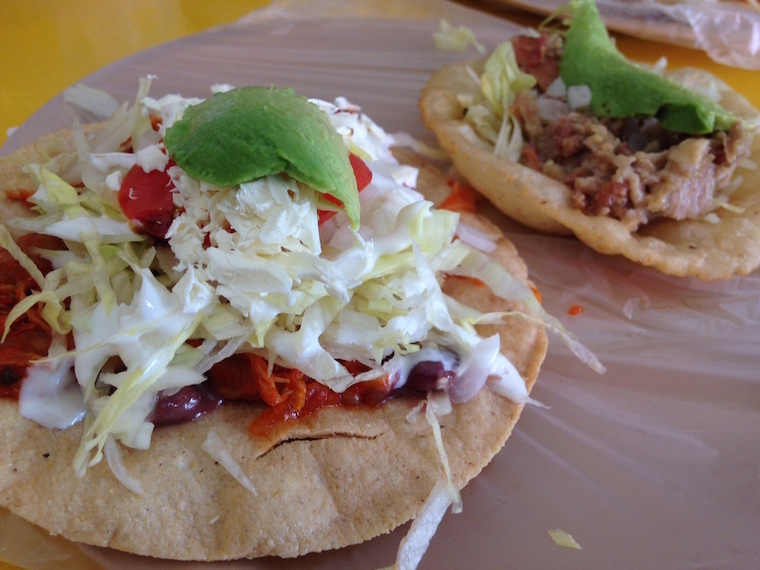 Note the corn part – the grain is the mainstay of local cooking, so you don’t see many flour tortillas in traditional restaurants. In Britain, the extent of chilli choices usually ends with green or red, but something like 12 different types of chillies are used regularly in Mexican cooking, each with their own subtle differences in flavour. It’s safe to say that Mexicans like their food hot. But unlike Thailand, where dishes will blow your head off straight from the kitchen, most Mexican restaurants and street food stalls will let you be the master of your own face-melting destiny with a range of table condiments. We learned pretty early on that at least one salsa is usually habañero – a substance to be approached with extreme caution (or at least a pint of milk). Then you get the milder salsas, guacamole, sometimes pickled veggies in a spicy liquid, sometimes a sauce with a tinge of tamarind. And as each place provides its own take on salsas with varying degrees of heat, you get to play a fun kind of roulette at every meal. 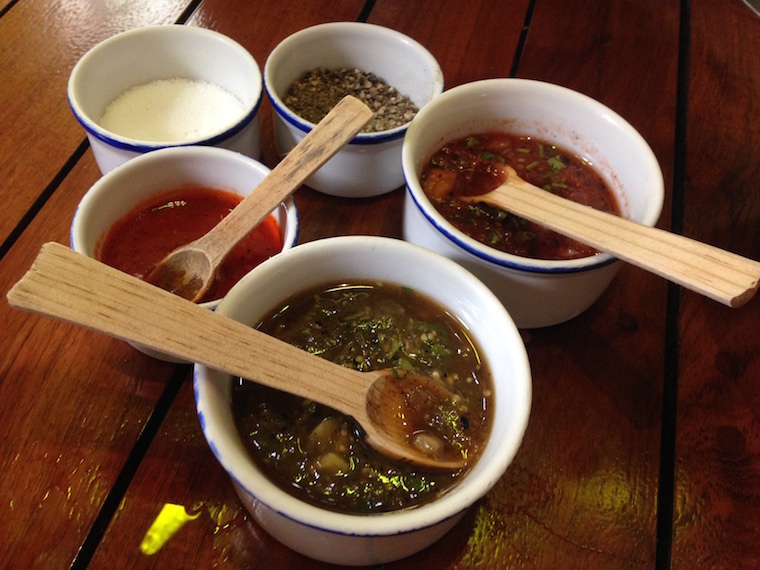 These four beauties are as ubiquitous on tables in Mexico as mustard, ketchup and HP Sauce would be in Wetherspoons. The flavour profile covers salty, sour, tangy and spicy, and they add a crazy kick to everything from fast food and ceviche, to popcorn and fruit. Valentina is a spicy, sour sauce that seems to be used mainly for spicing up fried foods and for pouring over potato chips and popcorn – you haven’t lived until you’ve added Valentina, Salsa Inglesa and Maggi to a deep cellophane bag of potato chips and then played the messy game of Trying Not To Get Sauce All Over Your Arm. I have not yet won this game. Salsa Inglesa is actually Worcestershire Sauce and, believe it or not, it’s super common in Mexico! It’s really popular to put on pizza and although it’s strange at first, normal pizza seems boring without it. You can even mix it with beer, Maggi and clamato juice (with a few more spices) to make a refreshing Bloody Mary-type drink called michelada. Maggi is the least interesting of all of them (sorry Maggi). It’s basically soy sauce. And finally, Tajin is a salty/spicy/lime-y powder that’s usually sprinkled on top of fruit to give it a good kick, but can be used as seasoning too. I know I said there are only four of these condiment staples, but I have to give an honorary mention to perhaps the greatest condiment discovery of all time: chipotle mayonnaise. It’s smoky, it’s spicy, it’s creamy, and while I still can’t quite agree with its use in relation to sushi, it’s award-winning stuff. We bought two bottles home with us and I’m already scanning the interwebz to find a dealer so I can get my sticky mitts on more. Dorilocos = Crazy Doritos! 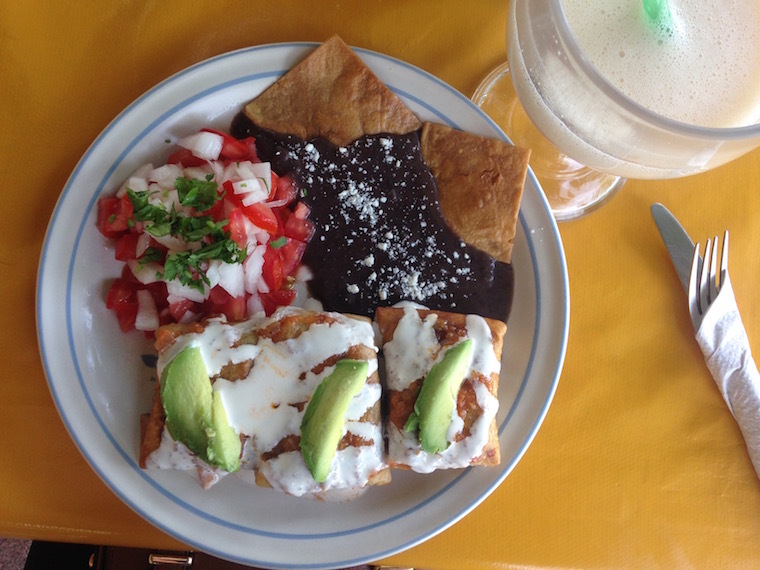 Only in Mexico could you take an unhealthy snack and add a bewildering amount of food to make it… confusing. But also kind of awesome. 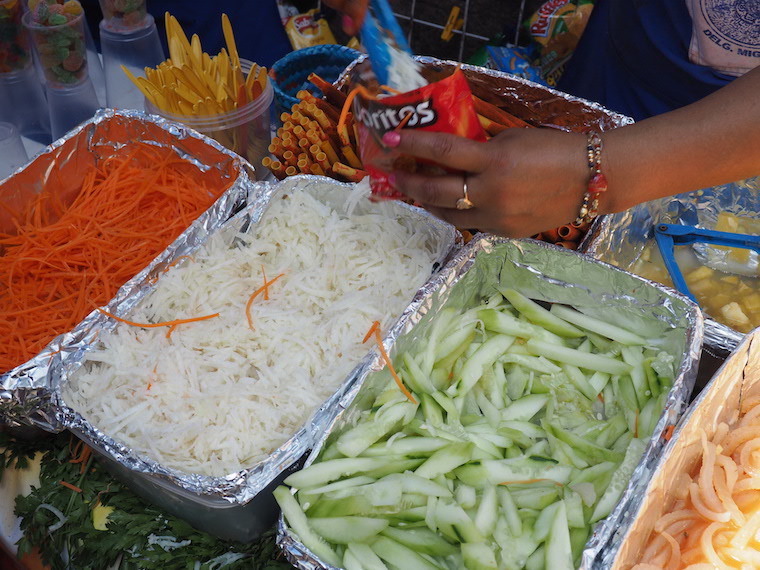 The vendor cuts open a packet of Doritos and then fills it up to the brim with toppings like grated carrot, fried onions, white cabbage, jicama (like a mild radish), beans, cucumber, crushed peanuts, bell peppers, lime juice, pineapple, the kitchen sink and several different hot sauces. Stick a plastic fork in there and you’re good to go. 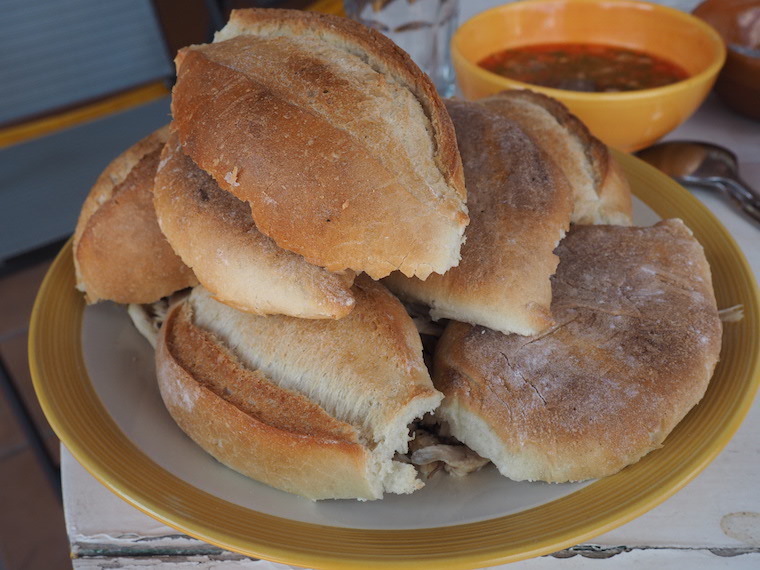 There are so many fillings you can add to a torta, but the thing that blew my mind was when the vendor clawed out and discarded the bread from the middle of the roll. On one hand I wanted to hold a moment’s silence for the pillowy carbs no longer with us, but on the other hand? THERE’S MORE ROOM FOR FILLINGS! And that means more meat/cheese/pickles/whatever the hell I’m having. Bravo. Molemolemolemole. Mole. So THAT’S Mexico’s national dish. I honestly thought it would be the taco. 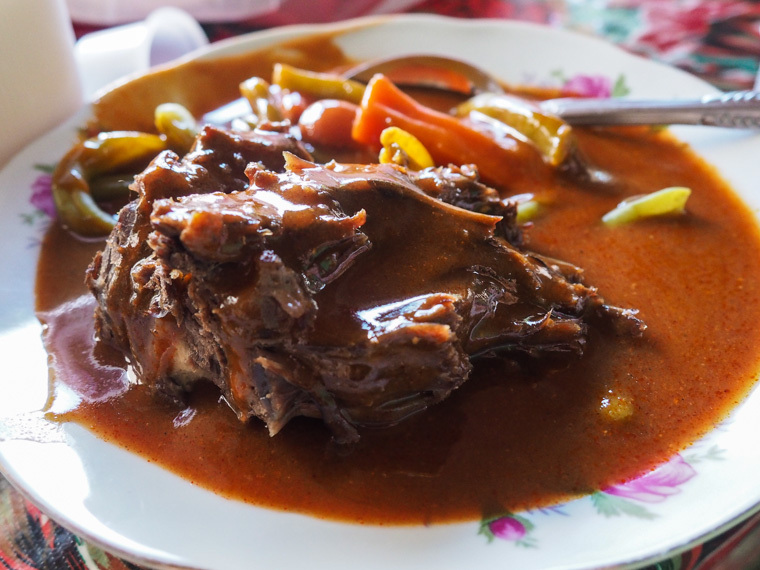 Mole is a rich and complicated dish that originated when a group of nuns had to improvise with what scant ingredients they had in the cupboards when an archbishop made an unexpected dinner visit. Using a mixture of nuts, stale bread, chocolate, chilli and some other spices, they conjured up a sauce that blew the archbishop’s socks off. The recipe has evolved over time to spawn a whole host of moles that have very little in common with each other. Oaxaca and Puebla are probably the two most notable destinations to try mole, with Oaxaca dubbed ‘the land of the seven moles’ due to each region having its own particular take on the dish. I actually got to make a red mole at a cooking class in Oaxaca, and while it was probably the best mole I tasted in Mexico (skillz), three things stood out for me – it takes an awful lot of time and energy to make it, there are literally (not literally) a gajillion ingredients, and I can honestly say I did not expect to be shallow frying cookies for stage 12 of 3,674 of the recipe (that may be an exaggeration). No wonder it’s usually saved for weddings and major celebrations. It’s a serious undertaking. Although I always try to approach food with an open mind wherever we happen to be travelling, the meat options in Mexico are not for the squeamish. Sure, you can stick to straightforward pork, chicken and beef, but if you want to eat what the locals eat you’re going have to sample some cuts you might not have tried at home. 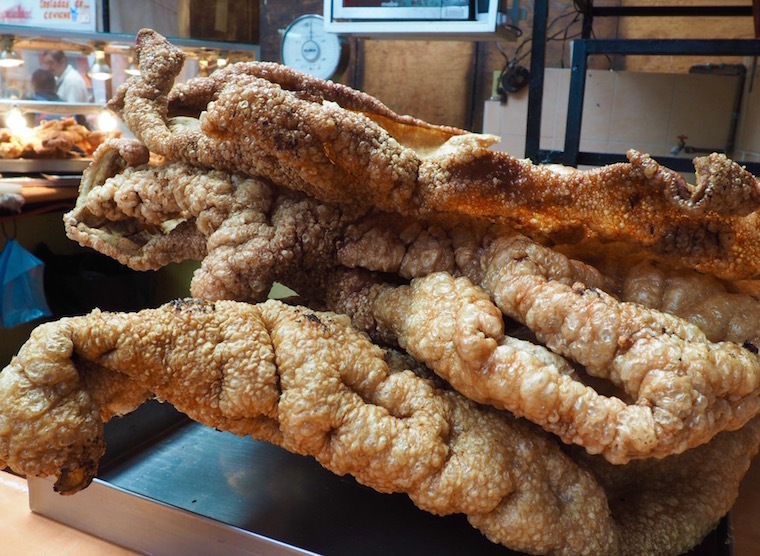 I’m talking cabeza de res (beef head), buche (pork stomach and throat), lengua (beef tongue), oreja (pig’s ear), sesos (calf’s brains) and tripas (cow intestines). Yummy! I also ate fried crickets fairly often (both desiccated and whole), worms and ants. All great sources of protein. Not so great for vegetarians. The cooking oil industry must be booming in Mexico. From tortillas to pig skin to bananas, you’ll be eating something fried in oil on almost a daily basis. It’s delicious, of course, but eat too much and it can leave you feeling a bit… claggy. Thank goodness for all that healthy seafood ceviche (served with fried totopos) and mole (see ‘shallow frying cookies’ line in no.7). Oh. Mexico certainly has a sweet tooth and its ‘postres and dulces’ are a sight to behold – go into any supermarket, bakery or market and you’ll find row upon row of treats. 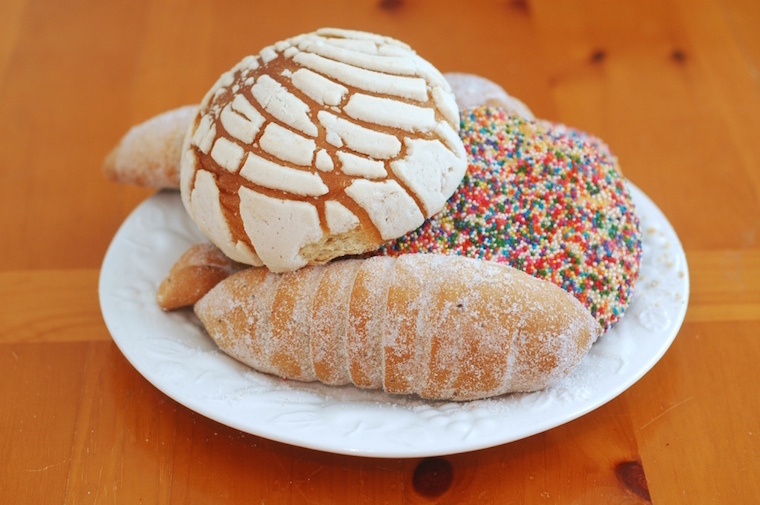 Panes dulces (sweet bread) are a really popular breakfast food and you often see people filling up huge paper bags with goodies for the whole family. Top tip: if you’re keen to try a pan dulce for yourself, go early and pick up the freshest you can find. Some of them turn very dry after sitting for a while, and I can tell you from first-hand experience that there’s nothing sadder than getting your goodies home only for them to crumble away into a stale dust. I found that my own sweet tooth could be calmed day-to-day just by drinking the sugary flavoured water called agua fresca, or getting amongst the hot chocolate and iced horchata. 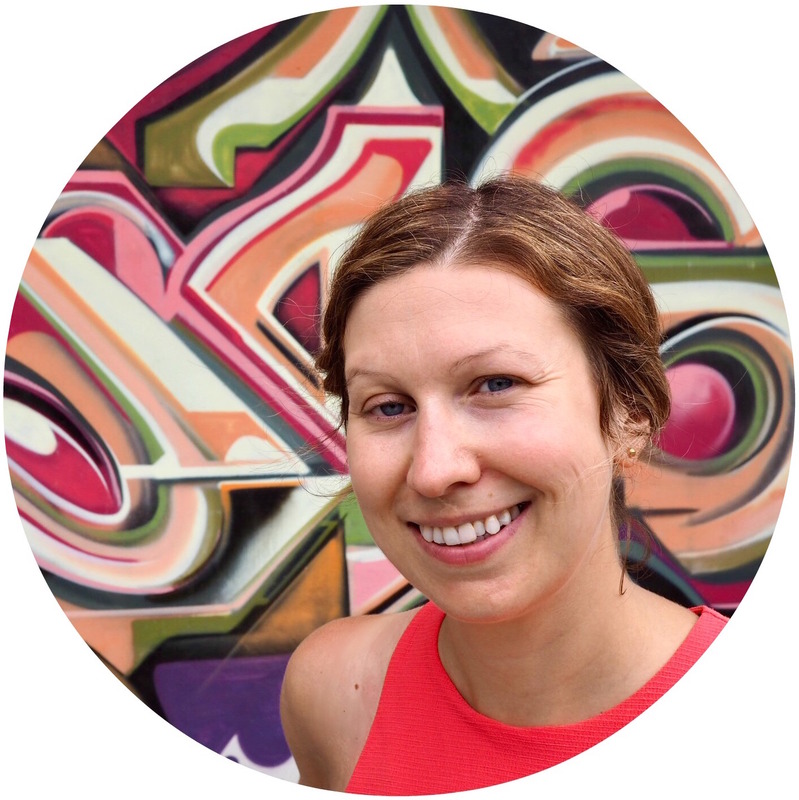 But don’t get me started on the churros – I didn’t find a single good vendor in 7 months of travel. A good excuse to go back, don’t you think? So, that’s my list. I actually have a lot more of these, but I figured: “287 things I’ve learned about Mexican food” might not be quite as appealing. Instead, why not share your own observations or assumptions in the comments below? Cheers!